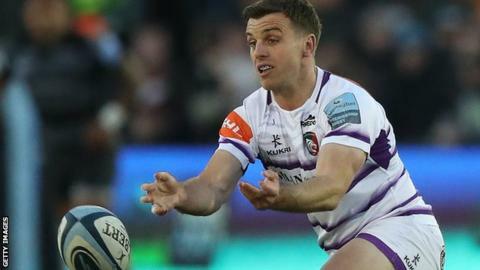 Leicester would be much deeper in the relegation mire were it not for the "phenomenal" George Ford, says Tigers and England team-mate Ben Youngs. Fly-half Ford was instrumental on Friday as Leicester beat Newcastle 27-22 to go eight points clear of Falcons, who are bottom of the Premiership. "I dare say without him, I don't know where we would be," Youngs told the Rugby Union Weekly podcast. "He's a world-class player and he's showing that to everyone." Defeat at Kingston Park would have left the Tigers on the verge of relegation to the Championship, but two tries from Guy Thompson and 12 points from Ford coupled with a valiant late defensive effort secured a priceless win. Youngs, who is out for the rest of the season after shoulder surgery, says Ford's game management was crucial in delivering a result that may have preserved Leicester's Premiership status. "I just think he's been unbelievable the last few weeks. His game control at the weekend was just phenomenal," he continued. "He has continued to grab the bull by the horns and steer the ship. Given the adversity, to play like he has, is credit to him. "But we still have three games to go and the Premiership has been just crazy. Until we are guaranteed safety, I will still be watching very nervously." Youngs is expected to miss about three months following his surgery, and should return in time for England's World Cup training camps later in the summer. He says he had no choice over the timing of the operation after picking up the injury against Scotland during the Six Nations. "At the time I felt it but thought it was OK and it would settle. I then had it scanned [following the Six Nations], went and saw the specialist, and he said 'you just can't play'," Youngs added. "I saw him at 12.30 and was being operated on at two o'clock so it all happened pretty quickly. "You never want to miss games but it happened and I didn't really have a choice in it. But it should be 12 weeks and a pretty simple recovery time provided there are no hiccups."